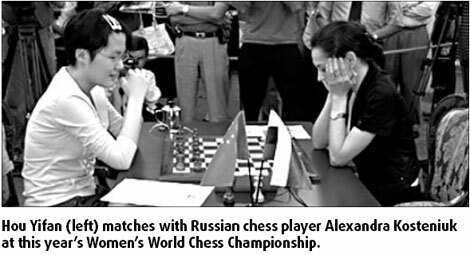 When Russian chess player Alexandra Kosteniuk won the Women's World Chess Championship in September, she was full of praise for her young opponent, 14-year-old Hou Yifan from China. "She is both a devilish tactician and a fierce fighter," Kosteniuk, 24, says of Hou. "She definitely has a great future." As the runner-up in the prestigious tournament, Hou became the youngest woman to win the Grandmaster title in the history of chess. Now, at the ongoing first World Mind Game Sports in Beijing, Hou has already won a bronze medal at women's chess event as a member of Chinese team. Hou may be young, but she has been playing chess a long time. A decade ago, the young player, who hails from the city of Xinghua in Jiangsu province, first became fascinated by the game. Hou's father, Hou Xuejian, often took his young daughter to a bookstore after dinner. He noticed that the little girl liked to stare at glass chess pieces behind the window. He later bought his daughter her first chess set. Only weeks later, the 3-year-old was able to beat her father and grandma. In 1999, the father found a chess mentor for his 5-year-old daughter. The teacher, Tong Yuanming, was a member of China's national chess team. Two weeks later, Tong told Hou that his girl was an unusual talent, showing "strong confidence, distinguished memory, calculating ability and fast reaction". The young girl's skills have impressed many people. Ye Jiangchuan, chief coach of the Chinese National Chess Teams (men's and women's teams), believes that Hou has a bright future. When she played against Ye for the first time in 2003, the chess master was surprised that the 9-year-old could identify almost all of his weak moves. "Then I knew she was an exceptional genius," Ye says. That year, Hou became the youngest member of the national team and won first place at the World Youth Championship for girls under age 10. Last June, she became China's youngest ever national champion.